E-Commerce has become so widespread nowadays that a mere online shop is often not enough for successful business because of the severe competition. This is where blogs come in handy, being the source of entertainment and fresh info to keep the audience interested and attract new customers to the store. Consequently, shopping cart platforms that offer both e-shop and blog functionality are in high demand. In this post, we are going to compare two most popular of them - Magento and WooCommerce. 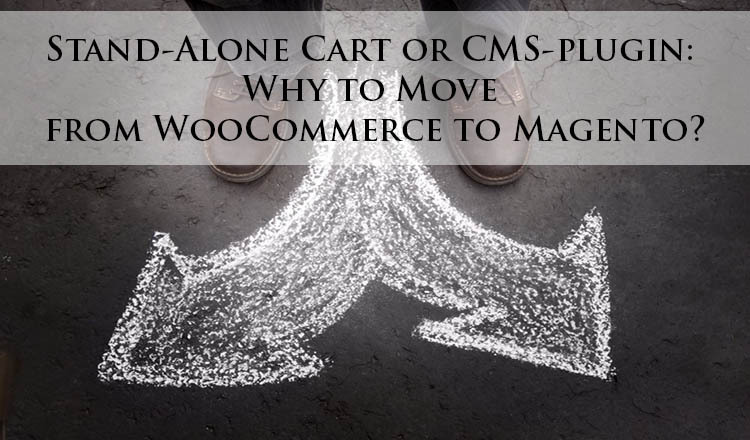 In fact, Magento is a fully functional shopping cart with CMS integration, while WooCommerce is an e-Commerce plugin for WordPress, world’s most popular CMS. So which combination works better? Let’s see. WordPress, the “mother” of WooCommerce, has made ease of use its major priority, and the same can be said about its most popular e-Commerce plugin. WooCommerce is perfect for newcomers into the e-business. With it, you can start an e-store real quick, without loads of complicated settings. Plus, this plugin is totally free of charge and is easily installed. Still, to set off selling successfully, you most probably will need a couple of extra extensions to extend payment gateways list, add extra shipping methods etc, and those are paid. Like many standalone shopping carts, WooCommerce sets no limit to the number of categories and products. However, for a big store with versatile goods it may be a little inconvenient since it allows filtering only by one parameter, which may be not enough for a shopper to find the needed product. On the contrary, Magento has a rich set of functions out of the box, but requires more experience compared to WooCommerce to tune it. It is the leader on the e-Commerce market, powering over 200k e-shops. Magento is a really powerful engine with potential to work perfect for huge stores and equally good for small and medium ones. Its peculiar feature is multistore – the ability to manage several stores from one backend. Other than that, it’s got an army of dedicated fans who constantly contribute new extensions and updates to keep the software in the best shape possible. As to the blog, you can use this platform as CMS as well. So, while WooCommerce is a very good shopping cart to start with, Magento provides everything for a quickly growing business. If your store is getting really big – or you’re planning on having more than one – Magento can be a more viable solution than WooCommerce. And you can move virtually all the data from WooCommerce to Magento with no previous experience or programming skills– just check out this prezi to see how. So, WooCommerce to Magento migration is quick and easy with Cart2Cart migration service. In just a few mouse clicks you’ll be able to set up your migration and enjoy your new store in a matter of a couple of hours.